Trad climbing offers an unparalleled sense of freedom. With the appropriate skills, training, and equipment you really do have the ability to go anywhere. Here we give the low down on how to get started, in an extract from our new special edition magazine: Get into Climbing. Trad routes don’t have bolts on them like sport and indoor routes. The lead climber places protection such as cams, hexes and nuts in cracks and weaknesses in the rock as they go, then clips these to the rope using a quickdraw. Placing protection properly can take time, strength and stamina to do safely. You’ll get quicker with practise. The job of the second is to belay the lead climber to the top of the pitch, wait while a belay is set up, then follow the route on a top-rope, taking out the protection placed by the leader along the way, leaving the rock as it was before. It’s important that the leader and second communicate clearly during this whole process. 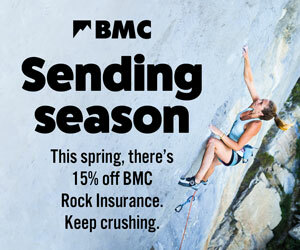 Watch how to use climbing calls on BMC TV. Many more skills are required to lead a trad route than a sport or indoor one. Climb your ﬁrst trad routes as a second with a more experienced climber or instructor. As you take out the leader-placed protection, observe how it was done. When you get to the top, examine the belay. It takes time to learn what size of what protection would ﬁt in what kind of crack or rock weakness, so practise at ground level. You’ll also need to practise setting up a belay before you’re faced with this responsibility for real. Find out more about how to build a belay. Your ﬁrst experiences of climbing outdoors are likely to be on single pitch climbs, where you climb from the bottom to the top and descend again within a single rope length. Communication is easier on shorter, single pitch climbs. Backing off climbs is easier, too. Climbing single pitch routes is also a good way to develop your skills because you can climb many different routes in a day. Multi pitch trad is more of a challenge both physically and logistically. Not only do you have to keep climbing pitch after pitch, but you also have to be slick with your rope work too. Don’t let this put you off though. Persevere and it will grant you access to some of the most amazing climbing on offer – long routes within mountainous environments and adventurous routes on sea cliffs. As with indoor and sport routes, there is a grading system to rate the difﬁculty of trad routes. 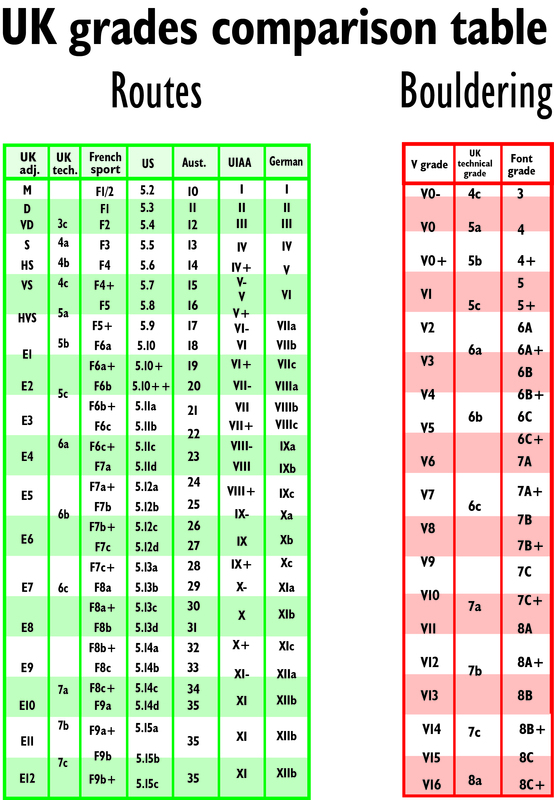 However, indoor and sport routes use the French grading system, while trad climbs use the British grading system. Although the two look similar - both using ﬁgures such as 6a, 6b, 6c - they do not actually correspond. This is a regular point of confusion. The adjectival grade: British trad routes usually have an adjectival grade and a technical grade. The adjectival grade, e.g. Severe, Hard Severe, Very Severe, attempts to give a sense of the overall difﬁ culty of a climb, taking into account many aspects including seriousness, technical difﬁculty, exposure, strenuousness and rock quality. The technical grade: This, e.g. 4b, 4c, 5a, indicates the hardest move on the route, irrespective of how many of them there might be, how strenuous it is, or how frightened you are when you do it. How the two grades ﬁ t together is complicated. A grade such as Very Severe (or VS) can range between VS 4a to VS 5a. VS 4a will ordinarily have quite easy moves technically, but involve quite bold climbing, therefore meriting the VS adjectival grade. A VS 5a, on the other hand, would have a much harder technical move in it than a VS 4a, but should be very well-protected, hence meriting a VS rather than a higher adjectival grade. Most grades have an average where the climbs strike a good balance between the difﬁculty of the moves and the quality of the protection. These are roughly: S, 4a; HS, 4b; VS, 4c; HVS, 5a; E1, 5b; E2, 5c. Trad guidebooks are ﬁlled with detailed descriptions, topographies of routes and grades. Usually they cover one particular area. To begin with, it’s worth buying selective guidebooks, which feature a selection of the best routes from a large area or region such as the Peak District or North Wales. Once you’ve got a feel for the areas you like best, deﬁnitive guidebooks feature a comprehensive review of every route within a smaller area (e.g. Stanage, Burbage and Froggatt). Most routes in the UK are trad, so there’s plenty to do once you get the hang of it. Before taking your first trad climbing steps you will need to get kitted out correctly. In addition to your harness, shoes, helmet and chalk bag you will also need: a belay device, slings, quickdraws, camming devices or karabiners, nuts, hexes, a nut key, screw gate karabiners and a climbing rope. Read more about what gear you need to climb outside.